I wrote yesterday about content providers disintermediating newspapers. Advertisers are doing the same. We’ve all heard about the effects that craigslist has had on the three pillars of the classified business: real estate, automotive and recruitment. Direct-to-consumer email poses a similar threat to Run-of-Print and insert advertising. For a long time, newspapers have been the cheapest way to reach mass audiences for airlines, banks and retailers. They’re cheaper than direct mail. Email and the Web change all that. Target took Easter Sunday off from its newspaper circular. But that doesn’t mean there isn’t a sale this week. You just have to go online to get it. You can focus on the categories that interest you. You can create a shopping list. It has a built-in store locator. Based on your ZIP code, it displays the stores near you. You don’t have to haul it to the recycling bin. The big advantage that the print product has is that it’s faster to flip through paper than clicking on page after page. 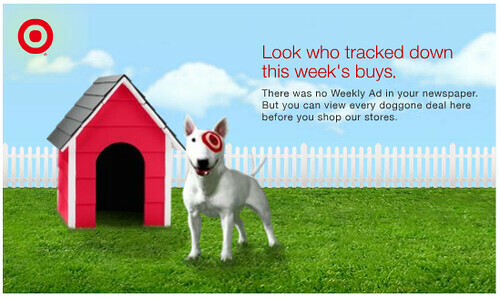 But there’s opportunity there, too: one thing Target doesn’t do is customize the ad based on your purchase history. Harris Teeter, a regional grocery store, does. Based on their VIC loyalty card program, they send a weekly email that highlights the products that you purchase. There is one bright side for the newspaper industry in this: the company that powers most of the electronic circulars, ShopLocal, is owned by Gannett, McClatchy and Tribune. This entry was posted in advertising, local search, media, newspapers, publishing. Bookmark the permalink.